Zach Redmond has Settled into Breaking a Record · Let's Go Amerks! 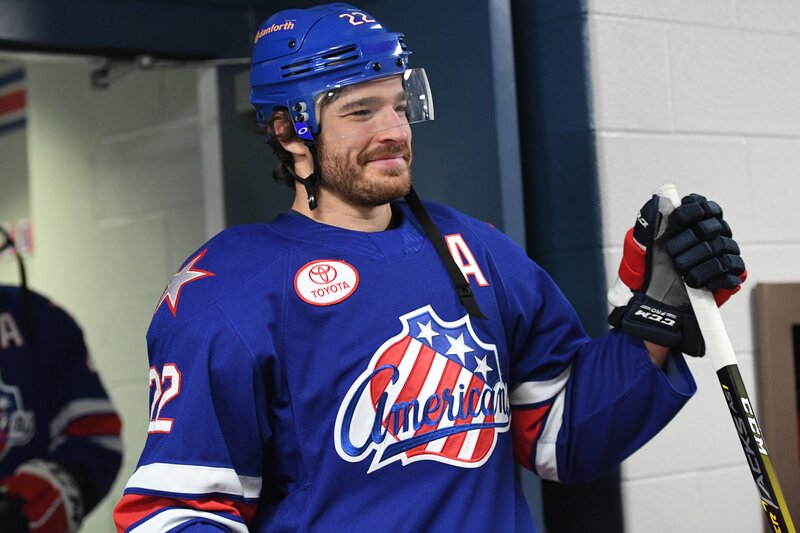 When Zach Redmond was traded to the Buffalo Sabres organization on the eve of the 2017/2018 NHL regular season starting it’s highly unlikely that anyone could have predicted that Redmond would be entering the record books of the Rochester Americans. On the surface it was a simple trade between two NHL teams sending defenseman to new organizations for a fresh start. Here we are 15 months later with history being made. The record of 18 goals in the regular season was set 46 years ago by Rick Pagnutti during the 1972/1973 season. The coach that season was Don Cherry. Redmond tied that record last Friday when he scored twice against the Wilkes-Barre/Scranton Penguins to reach the 18 goal mark in 40 games. He has 36 games remaining in the regular season to score one more. Last season Redmond scored 15 goals in 66 games. There have been five other players to score either 16 or 17 goals to come close to the record. Five players from five different eras. Depending on your age will depend on who you remember the most. TJ Brennan came close another time during the 2012/2013 season when he scored 14 goals in 36 games. His time in Rochester came to an end when the Sabres called him up and then he was traded to the Florida Panthers. Philippe Boucher also had a near record pace cut short due to a trade during the 1994/1995 season. He had 14 goals in 43 games which earned him a call up to the Sabres and that also resulted in a trade. He was dealt to the Los Angeles Kings. Being traded away from the organization is one thing that Redmond doesn’t have to worry about. Over the summer he was willing to come back and let the organization what he wanted and they said no problem. He signed a two year contract that would pay him $625,000 the first year and $650,000 the second year. That’s National Hockey League money on an American League contract. No one is surprised at how well he’s doing. CJ Smith, Kevin Porter, and Brendan Guhle all said not surprised at all the way he’s playing and scoring. Redmond has scored from the right side, the left side, the point, down low. The goals haven’t been flukes, he has a lethal shot and it’s earned him an appearance in the 2019 AHL All-Star game.